There is a big freakout over a possible fiscal cliff deal including the use of something called "chained CPI" to calculate increases in Social Security benefits. Go to Huffington Post, Daily Kos or another "liberal" blog and you will see people who never supported the president in the first place but nonetheless claim to be his "base" lamenting over what a backstabber he is. The president, as part of the fiscal cliff negotiation offers and counteroffers, has apparently opened the possibility of slightly adjusting the way cost of living increases are calculated for Social Security, by tying it (and all other government accounting) to a "chained CPI" model, a more accurate measure of inflation that accounts for the idea (and fact) that consumers often replace an item with increasing prices with a less expensive substitute. Apparently, this set off more alarm bells on the Left's media than Pearl Harbor. But as with most hair-on-fire freakouts, there is less here than meets the eye. What is this Chained CPI thing? (c) 15 percent of his/her average indexed monthly earnings over $4,517. Again, these "bend points" are adjusted by a formula that has been set in law since 1979, are based on wage-growth, and there is absolutely no changes to that formula in the gang of six plan, and the changes proposed to it in the Fiscal Commission plan actually increases the base benefits for the poorest workers who are also likely to have the least in savings or other retirement income. A chained CPI measure would also collect more taxes. Tax brackets, like social security benefits, are indexed to inflation, which means that just every so slightly, more people will fall into slightly higher brackets. Asked whether she considers chained CPI a benefit cut, Pelosi told reporters Wednesday, “No. I don’t. I consider it strengthening of Social Security." But but but... won't this still reduce the total lifetime benefit of a senior? Yes, insofar as each additional year lived is an increase in one's lifetime benefits. The only way you can honestly term the Chained CPI measure a "cut" is if you are willing to also make the case that every additional year lived is an "increase" in benefits. Which of our beloved defenders of Social Security would like to make this case to seniors, please step forward. Chained CPI is not a cut in baseline benefits in Social Security. Even Paul Krugman - the Professional Left's greatest self-proclaimed bearded professor - admits that initial benefits are determined by one's earnings, but that chained CPI would reduce the rate of growth of those benefits by about 0.3%. For every "progressive" who believes that such slowing of the rate of growth is a "benefit cut," I would like them also to step forward and with a straight face, tell me that cutting the rate of growth of defense spending is a "cut" in defense spending. If you think you're a liberal, go ahead and try to say that. Out loud. With a straight face. You can't do it, can you? But, Social Security is fine for now! A key arguments zealous liberals often present is that Social Security is in no imminent danger, and so there is no hurry to fix whatever longer term funding issues it might have. Sure, Social Security is safe and sound for the next 20-25 years or so. And that is true. Higher taxes on the rich: The president, as his counteroffer, has asked for tax rates to go up for at least those making more than $400,000, in response to Speaker Boehner's offer of letting the rates go up on incomes over $1 million. The proposal would also cap the value of itemized deductions to 28%, basically preventing the rich from taking a greater percent of their incomes in deductions than middle class families. This, along with the president's proposal to raise capital gains and dividend rates, as well as increasing the estate tax, should bring us pretty close to $1.2 trillion. No changes to Medicare benefits. Extended unemployment benefits and refundable tax credits for the poor and the middle class. A two-year extension in the debt limit, avoiding another hostage crisis in a couple of months. In other words, this minor adjustment to social security, which will prolong the trust fund's life, is a small compromise to get Republicans to pretty much lay down and take it on almost every single one of the president's, and progressives', priorities. This is a deal the Republicans are being dared to oppose. They wanted the president to put "entitlements" on the table, and well, he did. Now the Republicans almost have to say yes if they don't want to be blamed for causing another recession next year. Let's also get something drilled into our heads. Social Security is not in danger today because of two reasons: the first of these is that the trust fund is sound and able to pay all benefits until 2037. The second is that Barack Obama is president. 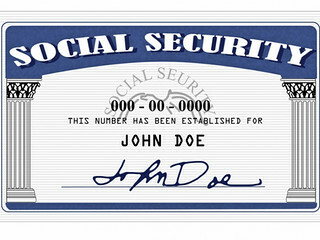 Social Security will have to be adjusted at some point between now and 2037. The later we do it, the more drastic such adjustments will have to be. We can make the necessary changes under the watchful eyes of Barack Obama now, or have it stolen by a future Republican president later. For a moment, let's quickly review the president's record on the social safety net: This president has increased benefits under Medicare by eliminating copays for annual checkups and preventive care, as well closing the prescription drug coverage gap. If you reasonably assume that the people saving money in those ways in Medicare would otherwise have to pay that extra cash from their Social Security checks, President Obama has, in effect, increased senior's disposable income after medical costs. If you really want to make sure seniors don't go broke, work with the president to make farther reforms of the health care system and its costs, instead of throwing tantrums over a 0.3% reduction in the rate of growth (not actual baseline benefits) in Social Security payments. This is the hardest concept for the ideologues on both sides to grasp. Governing is compromising. Sure, the best way to strengthen Social Security, from the perspective of liberals, would be simply to eliminate the cap on incomes subject to the payroll tax. But politically, that is as possible as passing a single payer health care plan through Congress, another best-case liberal solution. As progressives, we can either bellyache about what is ideal, or craft what is possible. We cannot do both. Let's craft the possible. Let's get off the cliff. Let's get the president's back. Tell him and Leader Pelosi you support them. Let's get his plan passed.